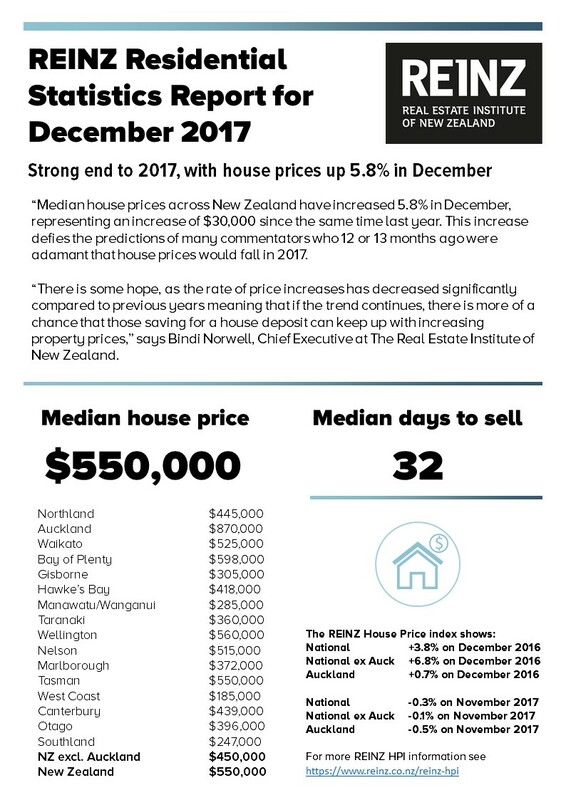 The latest statistics just in from REINZ show the median house prices across New Zealand rose by 5.8% year-on-year to $550,000 – up from $520,000 in December 2016 and median prices for New Zealand excluding Auckland increased by 6.6% to $450,000. 13 out of 16 regions saw prices increase in December, with three of those regions experiencing record prices - Waikato reaching $525,000, Bay of Plenty reaching $598,000 and Wellington reaching $560,000. The number of properties sold in December across New Zealand decreased by 10.1% to 5,903 – down from 6,567 in December 2016 and the number of properties sold in New Zealand excluding Auckland decreased by 11.6% to 4,184.